Laurence Brooke enrolled at the University of Glasgow in 1773 as a student of Medicine. He was born in 1758 to a prominent landowner family, Richard and Ann Brooke, owners of Smithfield plantation, Virginia, USA. He was sent with his older brother, Robert to Scotland to study Medicine. 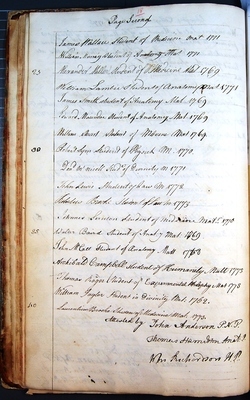 Both brothers matriculated at the University of Glasgow in 1773 to study an Arts course, both registering for William Richardson's Latin class. In the 1775, they signed the resgister of attested students promising "to attend the lectures [...] for the space of three months at least from the above date [14 November 1755]" in front of John Anderson, Thomas Hamilton and William Richardson. However, the Revolutionary War in America (1775-1783) interrupted Laurence's studies, forcing him to escape to France to evade capture by the British. Laurence stayed in France and eventually travelled to Nantes where he boarded the ship Bon Homme Richard, offering his medical services to doctor John Paul Jones on a letter of recommendation by Benjamin Franklin. Laurence returned to Virginia in August 1783 and practiced Medicine in Smithfield, Virginia. He died at the age of 45 in Fredericksburg.